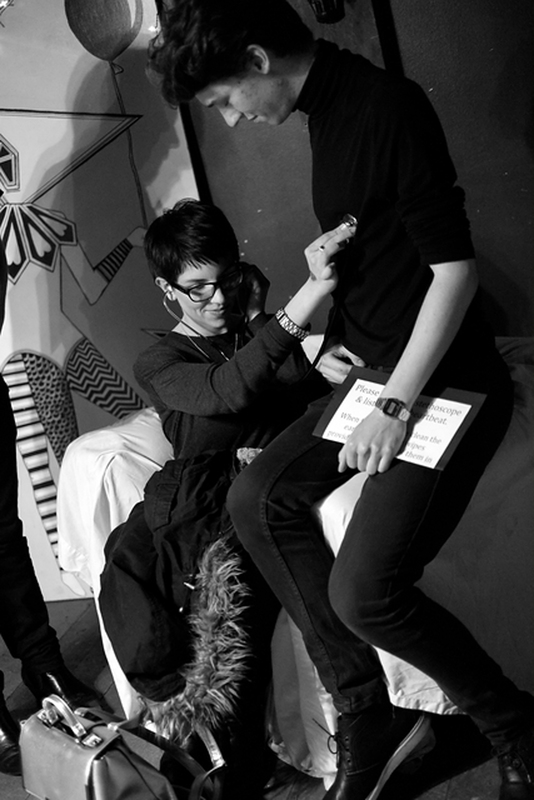 L(I’VE) (a) (HE)ART is a one-on-one intimate piece of live art taking place covertly from within the crowd. The audience members can choose how long or how short they listen to my heartbeat through the use of a doctors stethoscope. The performance consists of me allowing members of the public / audience to listen to my heartbeat through the use of a doctors stethoscope. This therefore, is a one-on-one intimate performance that plays with the boundaries of what is ‘one-on-one’ and ‘intimate’ performance. This performance débuted at the Manifold: Dance & Performance Art Platform hosted by TiLT Dance at The Kazimier, Liverpool. As a direct response to the Kazimier closing, between each individual performance the ear section of the stethoscope was cleaned, as a symbolic representation of a cultural hub being wiped away from Liverpool as the location closed at the end of 2015.